I was pleased with the results of the warm-pressure massage, a goodnight’s sleep and my shoulder was fine. I felt well rested. We had our first Vietnamese breakfast at Five restaurant: fried rice, spinach and feta pancakes with honey, chicken sausages, bacon and a sauce that resembles creole sauce. At least that’s what I had. Marcus had a lot more, which was a bit of everything and he loved it. With the option of ordering something from the A la carte menu, he toyed with the idea of having a steak but there was already so much on his plate! The steak would have to wait. We agreed to go for breakfast at nine the next day so we would have more time to eat- yes we did! There was a range of freshly pressed juices as well as a buffet of different pastries, breads, yoghurt, granola and fruit. I tried the watermelon juice – I loved it. I knew that I was going to be drinking watermelon juice for breakfast for the rest of my stay after the first sip. After breakfast, we changed into our robes and bamboo slippers then went for our spa treatments. I loved the convenience of having robes and slippers in the room so we didn’t have use to the changing rooms, not that there was anything wrong with them. They also provided bath kits in the room which included two pairs of disposable underwear for spa treatments. Since I had quite a few back treatments, I opted for a facial. Something to cleanse my pores, remove bags under my eyes and improve the tired skin that all Londoners get from pollution. The reception we received at the spa was the same, warm, lots of smiles and this time, white daisies. And again, fruit infused water before the treatment and herbal tea afterwards. Total relaxation. The treatment itself was better than any facial I had before. All the products used were 100% natural ingredients and included a 10 minute steam treatment. We promised ourselves that although this was going to be a relaxation only holiday, we would visit Hoi An, a world heritage site. 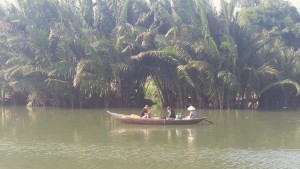 The resort runs a free shuttle service to and from Hoi An four times a day. We took the 12:30 shuttle to Hoi An. 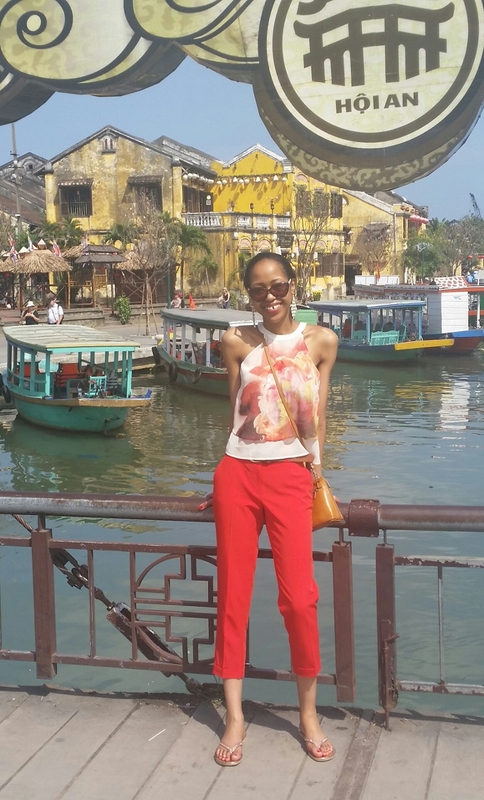 The sun smiled down on Hoi An like a parent impressed by their child. We felt cheated considering we had just driven some twenty or so kilometres from Da Nang and the cloud above the resort was mean. The yellow walls of the Ancient town along the river shone so brightly it felt like a smile. 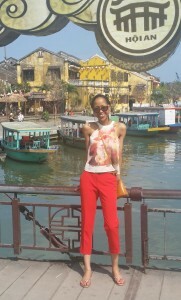 Hoi An was definitely the favourite child and I really wished our Fusionista could fix the weather back at Fusion Maia. We took our time strolling through the Old Town. Still on my quest for a decent pair of sandals, we stopped at the first shoe shop we came across. A small lady was sitting in a dark corner, her face lit up when she saw us. I liked her beaming smile and wished I could buy everything in her shop just so I can please her. “You like you like? Nice nice! ” she said whilst gesturing at everything in her shop. Before I knew it, she was kneeling at my feet, tapping on one with one hand and tapping the piece of paper with the other. She wanted me to put my foot on the paper so she can trace it! The last time I had my feet traced was when I was 6. My dad used to trace my feet before he drove some 60 km from the farm to the nearest city to buy me a new pair of shoes. I remembered the pen tickling me and asking him to trace my foot again and again. The memory made me giggle and she looked at me disapprovingly. I stopped. There was something about her, or something she did that ignited that childhood memory in me and I didn’t mind her seriousness now. 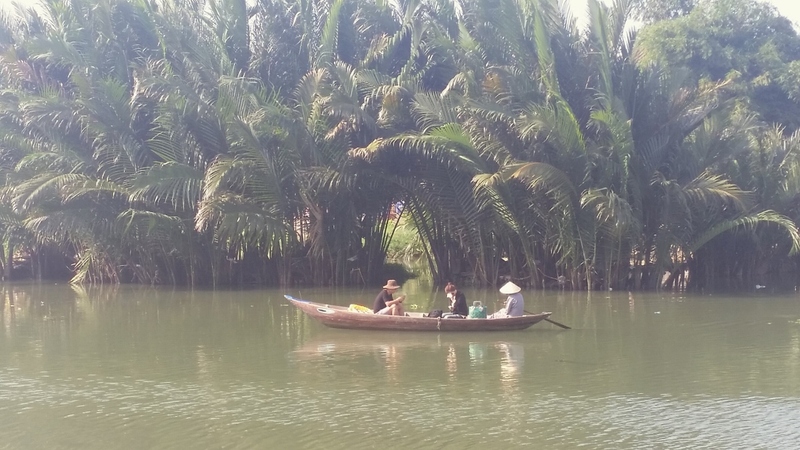 I was being charmed by the people of Vietnam. She finished tracing and once again, went to the back of the shop. Less than a minute later she was back. “Come back in one hour.” We didn’t have an hour, so we asked for half an hour. “OK half hour. Ten dollars now, five dollars in half hour.” And that was the deal settled. A few shops further down was what seemed to be a bike shop at first, selling bamboo bikes. Then we saw reed bags in the window and some quilts at the back of the shop. So we decided to go in. The bicycles were actually made out of bamboo and they are beautiful. They are such an original creation. But it was the water hyacinth bags that stole my heart so I bought one. Everything in the shop is made by Mekong +, which is a social enterprise project that aims to create sustainable employment for under-privileged women in remote and rural provinces of Vietnam and Cambodia. They now employ 350 women from different villages across the two countries! We didn’t do much walking afterwards. We initially set out to find Central Market but the many streets lined with shops and tailors served a much bigger distraction so we didn’t make it there in the end. Had we hired bikes, we probably could have seen more of the town, gone as far as Central Market and perhaps gone further and visited the small villages. I suppose this means I have to go back! Half an hour later we were back to pick up my sandals. I was encouraged to try them on. I was very pleased with them so much that I put my flip-flops in my bag and wore my new sandals out of her shop. The lady was smiling again and I found myself beaming in unison. I had the “new shoes” smile. The drive back to Fusion Maia seemed quicker but it couldn’t have been. We got back with just enough time to shower and go for our afternoon spa treatments at four o’clock. I booked the active bamboo roll out purely out of curiosity. I also wanted something that would help me relax after a day of walking. Bamboo roll out is the latest hot treatment that I’d say rivals hot stone massage. Hot bamboo sticks of different sizes are used to knead any stress or tension out of your muscles and at the same time help drain the lymphatic system. It’s perfect for helping you detox and boost immunity. I asked for a light pressure so I could get more of the relaxing effect. The turn down team had already been to our room by the time we returned. I loved the daily messages of encouragement they left each night. Each message corresponded with the theme of the day on the natural living programme. Thursdays are all about enjoying nature. The television was left on a promotional page for a barbecue that was taking place the same evening at Five restaurant. Naturally, that’s where we headed. The restaurant was a hive of activity. This was the first time we saw so many people at the resort. Although the resort was at full capacity (and always is as we later found out), we hardly saw anyone else and when we did, it was different people each time. This added to the exclusivity of the resort. Tonight though was different. Busy but not crowded. The service, still very much a five star service. We were ushered to our table, ordered our drinks then went to sample the fresh salad buffet before going to the barbecue. Two chefs were set up on the veranda tending to about ten Vietnamese barbecue clay pots with charcoal. There was a wide selection of sea food, meat and vegetarian options. Because I have a specific food allergy, I wasn’t able to eat everything that was on the barbecue. I asked if I could have a few things done differently. Such a diva right? I know, but nothing is impossible at Fusion Maia. I had two waiters taking turns to go to the kitchen downstairs, the barbecue upstairs, then bringing the food to me all night. They were my heroes for the night. At first I was worried that I would be left watching Marcus have his meat feast whilst I waited for my food but that wasn’t the case at all. If anything, I think I had everything a lot quicker than Marcus did! My favourite was the squid on a skewer and beef la lot (Vietnamese beef wrapped in betel leaves)- delicious! I love fish so I also had quite a few of the red snapper in banana leaf. The food was good, really good, the cocktails kept flowing, the night couldn’t have gone any better. We were stuffed our little bellies full of all the Vietnamese goodness we could get. We went to bed at a decent hour because after all, we promised ourselves an early breakfast!